From Three A. Joining the 1/-scale collectible figure series designed by Ashley Wood comes The Joker! He stands 13 1/2' tall and is fully articulated with LED illuminated eyes! 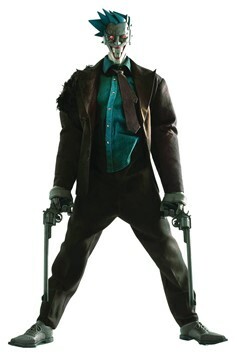 Figure includes an alternate damaged head sculpt, 'explosive damaged' detailed cloth suit, special joker themed shoes and 4 pairs of interchangeable hands. Additionally, he comes with two revolvers and bang flag accessories. Battery not included..